It is a popular rhyme of the district that “a loop of the Forth is worth an Earldom in the north”. If you were a monk living in Cambuskenneth Abbey in late medieval times, you probably never knew a minute’s peace. Nestling in a loop of the River Forth within sight of Stirling Castle, it enjoyed the patronage of Scotland’s kings but this very fact also made it a prime target for an invading army. The battles of Stirling Bridge, Bannockburn and Sauchieburn all took place within shouting distance of Cambuskenneth Abbey. After Bannockburn in 1314, Robert the Bruce held a parliament here; and after James III was killed at Sauchieburn in 1488 his body was brought to the Abbey for burial. In 1383 the building was sacked by the army of Richard III of England, and had to be re-built. The only possible consolation is that the occupants of Cambuskenneth had a good high tower from which they could see them all coming. Cambuskenneth dates from 1140, when David I of Scotland founded an abbey here for a community of Arrouaisian canons; this religious order sprang from the Abbey of Arrouaise in northern France. Cambuskenneth was later absorbed into the order of Augustinians. Alternatively spelled ‘Campuskenneth’, the name refers to the land in the loop of the river, and means ‘the field of Kenneth’, after a battle in the 9th century when Kenneth II clashed with the Picts. The Abbey was in fact dedicated to St Mary, but it is the name of Cambuskenneth that has stood the test of time. The tower stands 65 feet high, and it has obviously been restored to a certain extent because a painting from the early 20th century shows bushes growing out of a broken window in the upper storeys. It has a mesmerising presence, and it’s fascinating to gaze up at the ranks of grotesques below the parapet, which are either grinning defiantly or screaming in horror at some unseen and obviously unwelcome arrival. When you step inside, all you can see in the gloom of the small square chamber is a vaulted ceiling with a central hole, and a few relics of old stonework laid around for inspection. Although there is a stairway leading to the upper floors and the roof, this is not open to the public. Beside the tower is a ruined gateway leading into what is now a graveyard, and in my eagerness I overlooked this before I realised what all that ornamentation is about. This is not an entrance to the graveyard at all, but a doorway of a long-lost building – in fact, it is all that remains of the magnificent west entrance into the Abbey church. The Abbey was bounded on three sides by the river, an important defensive feature, and on the fourth side a bank and ditch were added. 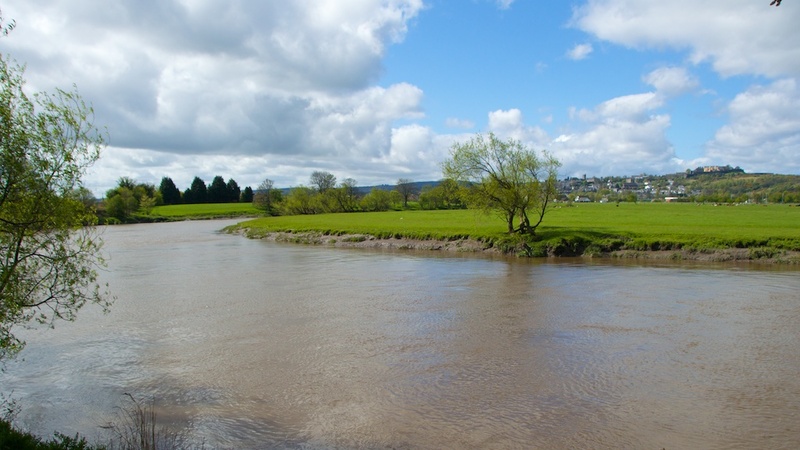 There would, however, have been river crossings, so that travellers to and from Stirling Castle could be ferried across the Forth. In the BBC TV programme ‘The Quest for Bannockburn – Digging Deeper’ archaeologists Neil Oliver and Tony Pollard searched for a lost water-gate which appears as a ruin in an old engraving. In 1306 the Bruce was crowned King of Scotland, and he summoned a Parliament at Cambuskenneth after his victory at Bannockburn in 1314. A local history website reveals that one chamber in the Abbey became known as ‘Parliament Hall’. In 1326, it was here that Bruce decided on the rights of succession that would give Scotland its long line of Stewart monarchs. In 1488 the unpopular James III was forced to take up arms against his 15-year-old son, who would soon become James IV. 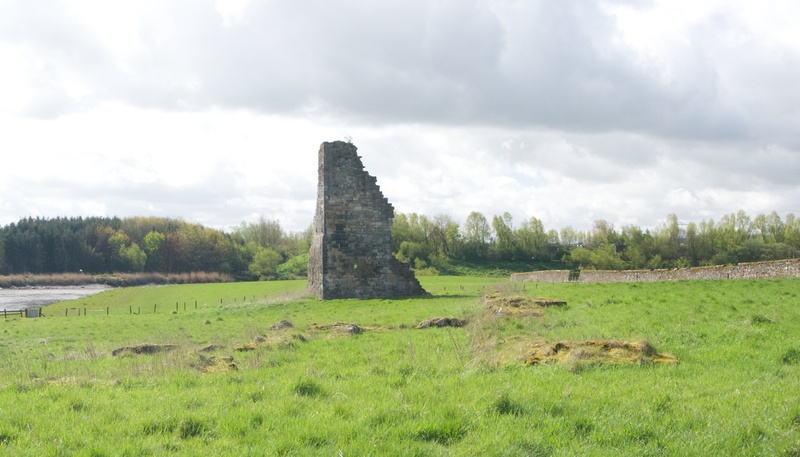 On 11th June a battle took place at Sauchie, about two miles south of Stirling, and James III was killed. Some rumours hint at an assassination as he fled the field, and others suggest that he was murdered before the fighting even started; all we know for sure is that his body was brought back to Cambuskenneth, where it was laid to rest beside his wife, Margaret of Denmark, who had died two years before. In 1865, bones thought to belong to James and Margaret were exhumed from the site of the high altar and re-interred in a suitably impressive Victorian-style tomb. Alongside it lies an open sarcophagus of the type that I’ve seen in places like St Andrew’s Cathedral, although I can find no confirmation that this contained the royal remains. In the mid-1500s the Reformation struck doom into the heart of so many lovely churches and monasteries, and it seems that Cambuskenneth was no exception. 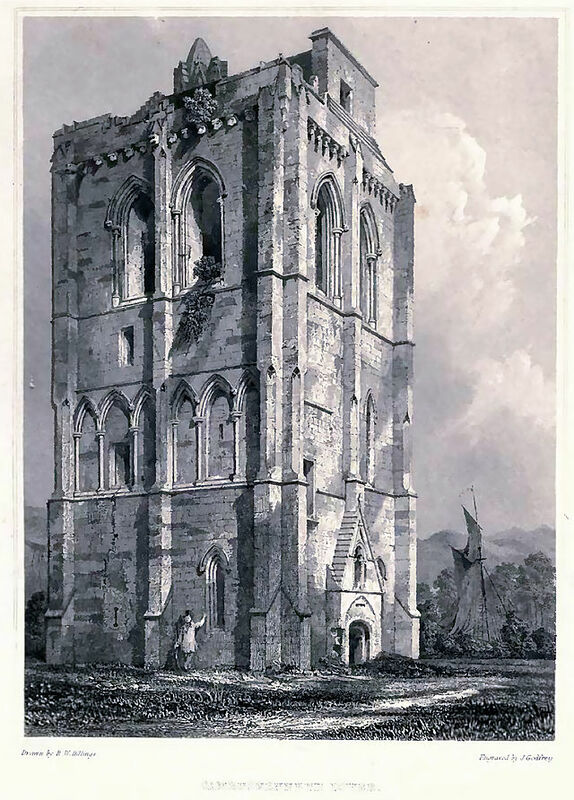 There is an alternative story, however, which states that the Abbey was demolished on the orders of one man – the 17th Earl of Mar, who plundered the rubble to build a new town house for himself in Stirling. Whichever version is true, it is lucky for us that at least the tower has survived unscathed – possibly, as one source suggests, because it was useful as a look-out post. The tranquil setting of Cambuskenneth Abbey certainly beguiled travellers of the early 1900s who loved nothing better than a romantically decaying pile set amid rolling countryside. I could see no signs of an orchard, but part of an old building, perhaps a dovecot or living quarters, stands in a field by the river. Protected by its own natural ‘moat’, Cambuskenneth has a serene, almost island-like feeling as if it’s one step away from the real world. 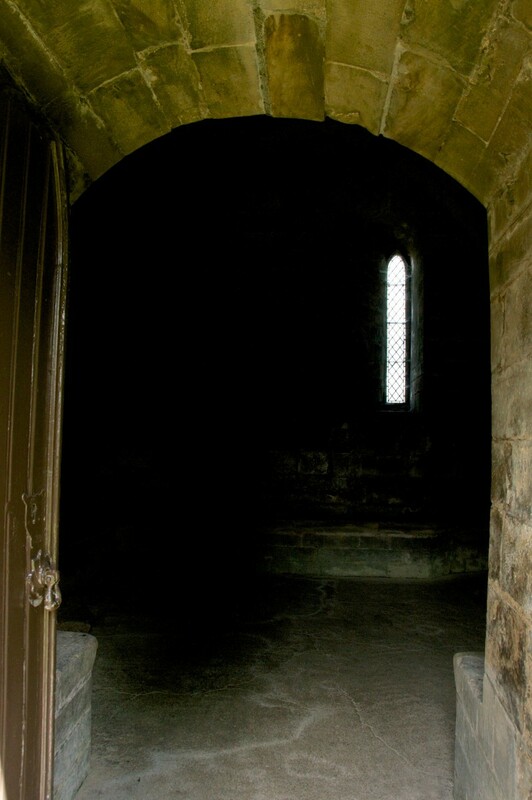 Some visitors have glimpsed the shadowy figures of monks on the first floor of the tower and on the turnpike stair. Apparitions thought to be James III or his queen, Margaret of Denmark, have been seen. I must admit that I didn’t sense anything otherworldly or threatening about the place, but that’s easy to say on a lovely spring morning with the birds singing and caretakers cutting the grass. On a dark evening with mist hugging the river, I’m sure it’s a different story. It would be good to go back there, and find out. There’s also a legend of a curse being placed upon John Erskine, 17th Earl of Mar, by an Abbot of Cambuskenneth, which caused the family to fall from grace with the loss of all their land and titles. Apparently the Abbot wanted to avenge the destruction of Cambuskenneth Abbey. It’s interesting to read that the Earl’s house, called Mar’s Wark, was never finished. In 2015 the Abbey will be open from 1st April to 30th September, between 9.30 am and 6 pm, 7 days a week. To find it, take the A907 out of Stirling and after about half a mile turn off towards Cambuskenneth. Follow the short road which leads through a quiet residential area and the abbey is at the end, set within a field. More details about visiting can be found at Historic Scotland. Beautiful photos Jo. Margaret of Denmark is one of my favorite Scottish queens. I imagine her as being lovely and refined and can picture her teaching Danish to James IV. I didn’t realize when I was at Stirling I was so close to the Abbey. Thank you, Susan! That’s a lovely thought about Margaret of Denmark. How awful that her son should end up involved in bringing about her husband’s death. This is the first time I’ve seen Cambuskenneth and it is in a real little backwater, despite being so close to Stirling. Very interesting post Jo. Only spolit by the fact that one of the grotesques is the double of one of my old Maths teachers! Thanks, David! And oh dear! You can’t unsee it now! 🙂 I’m quite glad I didn’t study maths at your school! very interesting indeed – thanks for sharing this fascinating story with us! Most interesting – I admire your thorough research which you share with us. That’s very kind of you, thank you! 🙂 I loved finding this place – not at all what I was expecting, as I thought it would be gaunt and austere but in fact it was anything but. Wonderful post, Jo! Enjoyed the video as well. So fascinating! Thanks for sharing another great place! Thank you very much, Lily, that’s so nice of you! Glad to know you enjoyed it. We were pleased with our photos – lovely lighting that morning. Jo, I find your posts extraordinarily interesting — particularly when I acknowledge that i probably will never get to any of the places you write about. Or maybe that’s why I enjoy them so much — you make them come alive. Thank you. Thank you Jo for these wonderful pictures and the story that goes with them…I never realized until now how important this was in our history…!!! Thank you so much for posting this…!!! Hi, April! It’s lovely to hear how much you enjoyed the story and photos. I didn’t realise the importance of Cambuskenneth either, until I went there… this is what I love about exploring old places! It’s a delight to share them, so thank you so much for your lovely comment! Thank you, Lorna! Yes, there’s something mysterious about this place! You keep coming up with fascinating Scottish historical places for me to learn about, Jo! I enjoy your blog as always! Believe it or not Terry and I were able to find the time to visit this Abbey with the help of our wonderful Cameron Tour guide. It seems to me they had some reading material near the grave of James III that implied his young son dressed as a monk may have been the murderer of his father for which he had to stay in good graces with the monks thenceforth. Am I remembering correctly? Your pictures will serve as my mementos since they outdistance mine by a hundred fold. I too did not feel any ominous ghostly vibes but it was also a day light visit and I would not challenge it with a night escapade given the circumstances. Hi Jean, How nice that you managed to get to Cambuskenneth! It’s not the most obvious place to go in Stirling, being a bit out of the way. Yes, you are remembering correctly about James III! It’s still a lovely quiet little burial ground, but an ideal place for spooky goings on at night, I would say. 🙂 Really glad you enjoyed this, and thank you! That’s interesting, Rachel! Thanks for that information. I will have another look to see where I found it.